Published: Nov. 6, 2016 at 11:49 p.m. Updated: Nov. 7, 2016 at 12:41 p.m.
We made it. Both of the weeks with six teams on byes are now behind us. With the fantasy playoffs drawing near (Week 14 in standard leagues), waiver-acquisitions become increasingly more important. Now is the time where those with bench space should look to stash upside plays, as well as high-value handcuffs. You'll find a few of each variety, as well as several plug-and-play options among the 17 players to target on fantasy waiver wires below. If none of these selections are available in your league, be sure to check out my weekly "Deep Dive" waiver column (published Mondays) for some high-upside players to aim for heading into Week 10. For those who use the Free Agent Acquisition Budget (FAAB) system, I provide a suggested spend for each player at the end of their analysis. If you have more specific FAAB questions, hit me up on Twitter. Absent since Week 5, the team remained cautious with Starks and held him out of the Week 9 loss to the Colts. 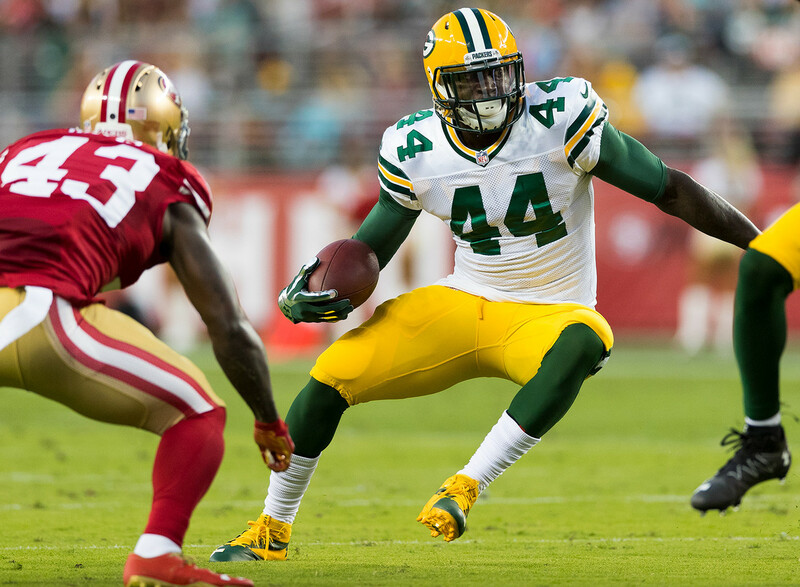 However, if Starks improves in practice this week, he very well could return to a heavy workload in Week 10 when the Packers travel to face the Titans. Green Bay lacks a running game right now, with Don Jackson, Ty Montgomery, Aaron Ripkowski, and Aaron Rodgers forming a four-player (and position) hybrid. It's an unsustainable formula, and the team will likely revert back to a more traditional approach if/when Starks gets healthy. Hopefully for fantasy owners that's Week 10. Regardless, Starks looks like a priority add this week as he's proven capable in the past of being productive with the featured role. We're approaching the waning months of the season and Starks' potential in this offense is worthy of a hefty waiver-investment. FAAB suggestion: 40 percent. Hightower backed up his strong Week 8 performance with a 23-carry, 87-yard, one-touchdown effort against the 49ers in Week 9 (with 15 receiving yards for good measure). This marks the second week in a row Hightower has received 20-plus carries, while Mark Ingram hasn�t done that since Weeks 10 and 11 in 2014. Now, Ingram had a big role on Sunday as well (15-158-1 rushing, 2-13-1 receiving), which speaks to the offensive shift happening for the Saints, as well as a matchup against a historically bad 49ers run defense. In Weeks 1-7, the team ran on 42 percent of their offensive plays, while that number jumped to 50 percent in Weeks 8 and 9. New Orleans now tries to control the clock and keep their shaky defense off the field, and it�s worked. They've won both games while out-possessing their opponents by over 30 minutes. All of this means both Hightower and Ingram will have fantasy value moving forward as part of a new (sigh) committee backfield. FAAB suggestion: 15 percent. It's hard to understand what is happening in the Eagles backfield. Despite head coach Doug Pederson insisting that Ryan Mathews is still the "lead guy" last week, the playing time split tells a different story. Over the last three weeks, Sproles has out-snapped Mathews 140 to 41, though Mathews' two touchdowns have kept him fantasy relevant. The Eagles host the Falcons next week; a game we'd expect them to be trailing in early. That favors a more Sproles-heavy approach once again. Hopefully this week, his increased playing time leads to more fantasy production as well. FAAB suggestion: 10 percent. Harris' fantasy value will take a colossal hit when Carlos Hyde is cleared from his shoulder injury (probably this week), but he's still worth grabbing off of waivers. After back-to-back solid performances filling in for Hyde, Harris has likely earned himself the backup role outright, but also potentially some rotational work as well. Harris runs with reckless abandon and has home-run speed, as we saw on his 47-yard touchdown reception against the Saints in Week 9. Hyde has a long history of injuries throughout his relatively short NFL career, making Harris one of the few handcuffs worth holding onto as the fantasy playoffs loom. FAAB suggestion: 10 percent. Filling in for the injured Matt Jones last week, Kelley turned in a productive outing across the pond with 87 yards and a touchdown on 21 carries. It wasn't a performance that will forever banish Jones to the bench once he's healthy, but Kelley didn't fumble and consistently gained positive yards -- two areas in which Jones tends to struggle. Altogether, Kelley never had a negative carry in Week 9 and collected four or more yards on 12 of his 21 totes. We won't know Jones' status for a tough Week 10 matchup against the Vikings until later this week, but Kelley is worth targeting regardless. Worst case, he's part of a committee on a high-powered offense. Best case, he takes over the featured workload from Jones and becomes a late-season waiver-wire steal. FAAB suggestion: 10 percent. The Giants hinted during their Week 8 bye that they planned to get rookie Paul Perkins more involved in an effort to jumpstart the ground game. That bore out in Week 9 as Perkins saw a season-high 21 snaps and 14 offensive touches (tying Rashad Jennings for the team lead in the latter). The Giants offense remains a bit of a mess, though Perkins is an excellent stash add this week for the stretch run. Jennings has never been the picture of health (already missing three games with injury this year alone), so Perkins could fall into a featured role, but at worst looks to be a primary member of this committee. At this point, we can't turn our collective fantasy noses up at that. FAAB suggestion: 5 percent. Much like Perkins, Dixon makes the cut as more of a stash this week. Head coach Jon Harbaugh wanted to see Dixon more involved after the team's Week 8 bye so Dixon saw 11 touches on Sunday, but was only able to take them for a measly 13 yards. He didn't really gain any ground on starter Terrance West, though with West also averaging just 1.4 yards per carry, he didn't exactly pull away either. Dixon gets a dream matchup in Week 10 facing the Browns on Thursday night, but his workload is tough to trust as a starter yet. If he ever does end up taking over this backfield, he'll be well worth the waiver investment now. FAAB suggestion: 5 percent. James White's role has diminished in recent weeks as he has seen just six touches since Week 7. The bad news for White, is that this is occurring right as Lewis is set to return. He isn't guaranteed to see the field in Week 10, but there's a good chance he could. Lewis was an every-week RB2 last year, even in standard formats, and that upside is worth chasing on the waiver wire this week. There are obvious concerns, as Lewis has undergone two knee procedures in the last calendar year, but he's a dynamic player attached to one of the league's best offenses. With Julian Edelman and Danny Amendola not offering a ton in the short-area passing game, Lewis could slide right back into a sizeable role. FAAB suggestion: 10 percent. Williams was already pushing to be the leader in the Chargers pass-catching corps, but with Travis Benjamin now battling a torn PCL it looks as if Williams will have that role on lockdown moving forward. Over the last four games he leads the team in receptions (17), and receiving yards (237), while his two touchdowns are tied with Antonio Gates, who is the only player he trails in targets (34 to 26). Next up for the Chargers is date with the Dolphins' patchwork secondary, setting up Williams and co. for another big outing. FAAB suggestion: 20 percent. Britt has had 67-plus receiving yards or a touchdown in six of eight games so far this year, proving to be surprisingly consistent in an overall inconsistent passing attack. He'll have WR3/flex appeal this coming weekend against a Jets secondary that continues to struggle against the pass. If Jared Goff takes over under center, though, we may want to rethink starting Britt until we see the rookie in game action. FAAB suggestion: 5 percent. Over the last five weeks, two players have five receiving touchdowns: Mike Evans and Rishard Matthews. Matthews' production has finally earned him the top spot in the Titans wide receiver pecking order, as he's led the group in snaps each of the last two weeks. Marcus Mariota has done a pretty fine job of spreading the ball around, but Matthews' penchant for hitting pay dirt shouldn't be ignored. Next up for him is a date with a Packers secondary that has had a season-long residence in the burn ward of the Bellin Memorial Hospital in Green Bay. He'll have some flex appeal from here on out as long as this Titans offense remains hot. FAAB suggestion: 5-10 percent. With Vincent Jackson (IR) and Russell Shepard (hip) out last week, Humphries stepped into a larger receiving role for the Bucs once again. He caught five of his seven targets for 46 yards and a touchdown, with most of that production coming from the slot. Shepard's status remains up in the air for Week 10 against the Bears, a team that has struggled at times to cover wide receivers in the slot (both Randall Cobb and Cole Beasley had strong days against them). On the season, Humphries lines up in the slot on 69 percent of his plays and sees 78 percent of his targets there as well. His floor is frightening with Mike Evans hogging the vast majority of the targets, but Humphries could post a sneaky good stat line this weekend, especially in PPR formats. FAAB suggestion: 5 percent. Crowder has rather quietly emerged as the top fantasy option in a crowded and talented Washington wide receiving corps. Over the last three weeks he leads the team in targets (26), receptions (19), receiving yards (267) and touchdowns (two). He faces a dreadful matchup this week against the Vikings, who are among the best defenses in the league at covering the slot. However, he's a player who shouldn't really be on waiver wires in most leagues any longer. FAAB suggestion: 10 percent. With Michael Floyd struggling, Nelson's Week 8 breakout performance (eight catches, 79 yards, two touchdowns) couldn't have come at a better time. It led Bruce Arians to anoint Nelson a "starter" moving forward, meaning he'll likely see the field in three-wide receiver sets alongside John Brown and Larry Fitzgerald. While that sounds minimal, the Cardinals trot out at least three wideouts on 70.5 percent of their plays in 2016. The Cardinals next face a 49ers defense that has its eyes on all-time records for ineptitude in 2016, giving Nelson a nice outlook for his return to action after the bye. FAAB suggestion: 5-10 percent. In his two games since returning from injury, Ebron has 14 catches on 18 targets for 171 yards. He heads into his bye this weekend, but is a player worth stashing. Tight end remains a veritable disaster in fantasy, and a player with Ebron's ability and target share is a weekly starter. He gets the Jaguars in Week 11. FAAB suggestion: 5-10 percent. Over the last four weeks, Fiedorowicz is third among tight ends in fantasy scoring (34.4 points) even though he was on his bye in Week 9. Since Week 4, the only pass-catching statistical category Fiedorowicz doesn't lead the Texans in is targets, where he trails DeAndre Hopkins 49 to 34. Brock Osweiler's limitations as a passer have forced him to look to his tight ends with increasing frequency. Fiedorowicz has the look of a weekly low-end TE1 from here on out, and can provide help for those losing Jack Doyle or Eric Ebron to byes this week. FAAB suggestion: 5 percent. I always try to offer at least one streaming quarterback option here, and this week the pickings are a bit slim. Siemian is coming off a decent day against the Raiders defense (15.23 fantasy points), and gets another plus matchup next week traveling to the Superdome to face the Saints. With four top-10 fantasy quarterbacks on byes next week, Siemian's number could get called in plenty of leagues against a Saints defense that allows over 18 fantasy points per game to opposing passers. FAAB suggestion: 0-5 percent.